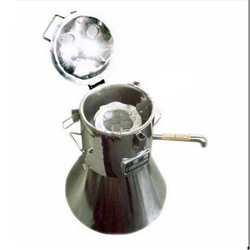 These units are suitable for routine sample analysis in Medical, Hospital, Pathology and Institutional laboratories. With a wide choice of rotor heads and adaptors, this unit is truly versatile. It has digital speed indicator and 0-60 minute Digital countdown timer . - Brushless low noise AC Induction Motor and Inverter Drive. Compact table top hamatocrite Centrifuge with see thru Acrylic Lid. Fitted with variable Speed Controller, Digital Speed Indicator, Digital Timer 0-15 minutes.Maximum r.p.m approx. 13000 with load. Bench Top high Speed Lab Centrifuge with Digital Speedometer, Digital Timer in the range of 0-59 Minutes and Speed Regulator. Maximum Speed 20000 r.p.m. (without Load). Supply completed with dust cover, instruction manual, cord & plug to work on 220 volts 50 Hz A.C. 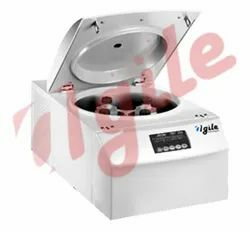 These micro centrifuges are ideal for growing routine application in biochemical and clinical labs, for hematrocrit, corpuscle percentage contents in preblood, serum analysis and precipitate separation etc. Unit has digital speed indicator and 0-15 minute digital countdown timer. Having a pre-determined quality administration system, we are thoroughly involved in delivering Non Refrigerated Table Top Centrifuges. - Different type of rotors available. - Looking for OEM customers.